In the News — Mount Wellington Cableway Co.
October 04, 2018 - Mountain Technology Magazine - PUBLIC feedback on a proposed AUS$50 million project that would connect Mount Wellington in Tasmania, Australia with the city of Hobart via an aerial tramway system has formally closed with over 8000 responses. September 09, 2018 - A statewide poll found 62 per cent of those surveyed supported the cable car proposal while about 30 per cent were opposed to the project, with 8 per cent undecided. The new poll compares with the result of a ReachTel poll for the Mercury in July 2017, which found 54.1 per cent support for the cable car. August 23, 2018 - JOHN CLEARY: IT is more than 20 years since the first serious proposal to construct a cable car to the pinnacle of Mt Wellington. August 06, 2018 - The Mercury: Swiss and Australian engineers overseeing the design and construction of Mount Wellington Cableway Company’s $50 million cable car visited the proposed base station site on the edges of Wellington Park yesterday just off Old Farm Rd. 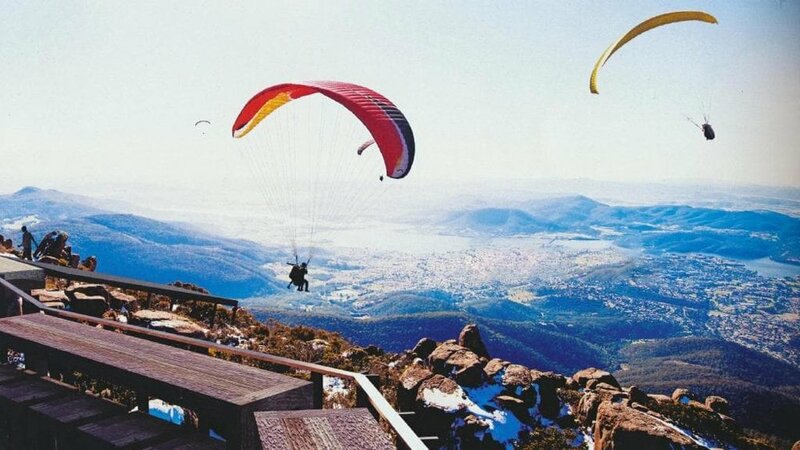 August 05, 2018 - The Mercury: PLANS for a paragliding launch ramp, new mountain bike trails and a 140-seat restaurant have been revealed for the proposed visitors’ centre at the pinnacle of kunanyi/Mt Wellington. August 04, 2018 - The Mercury: THE proponents of the cable car project will sell it to the public as a low-impact, environmentally friendly tourism investment that will improve the kunanyi/Mt Wellington experience. After years of speculation, the Mount Wellington Cableway Company will finally reveal today that its proposed $50 million cable car project will launch from a clearing along the main fire trail within Mount Wellington Park. March 31, 2018 - The Mercury - TRAFFIC congestion on Pinnacle Rd could drop by 60 per cent if the Mt Wellington cable car comes to fruition, say its proponents. Mt Wellington is Tasmania’s third most visited attraction, behind Salamanca Market and MONA. September 21, 2017 - The Mercury - A CABLE Car on kunanyi/Mt Wellington has moved closer to reality after the Upper House passed legislation 10:1 without amendment to acquire land at the pinnacle from the Hobart City Council. August 15, 2017 - FOLLOWING a spate of baseless claims by the Greens and protestors of impropriety and collusion, MWCC has welcomed the release of correspondence with State Growth Minister Matthew Groom’s office, following a Right To Information request by the Greens. July 24, 2017 - The Mercury - AMAJORITY of Tasmanians support a cable car to kunanyi/Mt Wellington, exclusive polling reveals. “Once we are able to actually show people what our plans and designs are we would like to think the support will be even greater,” Mr Bold said. February 26, 2017 - The Herald Sun - TASMANIAN leaders have thrown their support behind plans for a cable car on Mt Wellington and backed State Government moves to compulsorily acquire land on Mt Wellington to advance the $54 million project. February 26, 2017 - Government Media Release - After careful consideration, the Government has decided­ to prepare new laws to acquire the public land on kunanyi/Mt Wellington necessary for the project to proceed. August 9, 2016 - The Mercury - THE tourism industry has welcomed the State Government’s willingness to assess the Mt Wellington cable car as a Project of State Significance. “It’s the first time we have had a clear, tangible, positive step in terms of a Government putting some real process around the project,” Mr Martin said. August 8, 2016 - The Mercury - THE State Government has finally agreed to assess the potential of the Mt Wellington cable car as a Project of State Significance. “The Government is committed to giving the project an opportunity to be properly considered,” Minister for State Growth Matthew Groom said. Dec 2, 2015 - The Mercury - ONE of the most vocal opponents of the Mt Wellington cable car says she has had constructive talks with the team behind the proposal. Tasmanian Greens leader Cassy O’Connor said she was now satisfied the business case did not require a government handout. Dec 2, 2015 - The Mercury - STATE Growth Minister Matthew Groom says his government has not, and will not, offer financial assistance to the Mt Wellington cable car, as the proponent confirms it will not seek any state funds. Nov 28, 2015 - The Mercury - The man behind plans to put a cable car on Mt Wellington says he has raised the first $1 million needed for the $54 million project. Nov 12, 2015 - The Mercury - CABLE car proponent Adrian Bold says his team will begin the next round of talks with the community about his proposed tourism operation on Mt Wellington after a board meeting last night. Nov 6, 2015 - The Mercury - The cable car remains on track despite a Canadian ­financier’s announcement it had parted ways with the $54 million venture. “Mt Wellington Cableway Company are delighted by the recent investment from a number of significant and well-known Tasmanians to financially progress the project,” Mr Rainey said. 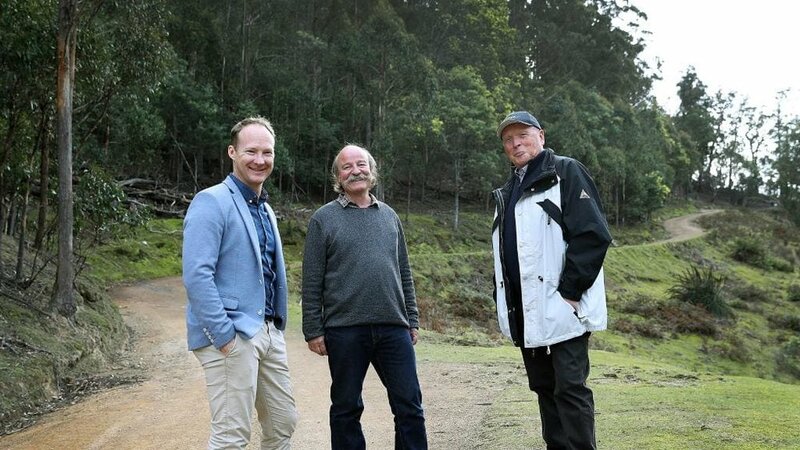 Nov 4, 2015 - The Mercury - CABLE car proponent Adrian Bold says he is set to deliver the next major eco-tourism project in Tasmania after the Wellington Park Management Trust increased the area for commercial development on the Pinnacle by 15 per cent. Sep 3, 2015 - The Mercury - A State Council motion jointly proposed by the Sandy Bay, West Hobart and Lower Sandy Bay branches of the Tasmanian Liberal Party called on the State Government to declare the proposed Mt Wellington cable car a project of state signif­icance. Apr 20, 2015 - The Mercury - THE Hobart City Council has accused the Wellington Park Management Trust of a lack of transparency and failing “Planning 101’’ during a ­hearing about extending the development zone on Mt ­Wellington. [irony alert] Trust chairwoman Christine Mucha said that the rezoning followed a request from the Mt Wellington ­Cableway Company. April 16, 2015 - The Mercury - Cable car proponents are confident the project will clear a major planning hurdle on Monday. The Tasmanian Planning Commission public hearing to extend the development zone on the pinnacle of Mt Wellington by 1.1ha is one of the last remaining steps. Editorial - The Advocate - OPPOSITION to a cable car at Mount Wellington is probably the clearest example of the anti-progress brigade stopping Tasmania from capitalising on its recent good tourist visitor numbers. Tourists and locals alike deserve more than to be able to perhaps pack a thermos of coffee and drive to the summit, throw snowballs and enjoy the stunning view. Nov 12, 2014 - The Mercury - Mount Wellington Cableway Company's project has been accepted by the Tasmanian Major Projects Approval Agency. The agency aims to provide advice on environmental approvals for projects worth more than $50 million. Nov 3, 2014 - The Mercury - ONE of the first hurdles of the current cable car proposal looks set to be cleared. The Wellington Park Management Trust yesterday rel­eased its report into a proposal to extend the development zone on the pinnacle of Mt Wellington by 1.1ha. It indicated it was in favour of the changes. The trust said 551 submissions had been received during the public comment period. Sep 1, 2014 - The Mercury - A CALL for Lord Mayor Damon Thomas to rein in alderman Jeff Briscoe “for his anti-cable car crusade’’ has ignited furious debate within the ranks of the Hobart City Council as it gets set to reject a proposed amendment by the Wellington Park Trust to extend the pinnacle zone. Sep 14, 2014 - The Mercury - THE proposal for a cable car on Mt Wellington has significant statewide backing after a poll of 2646 residents found people aged between 35 and 50 were the strongest supporters. ReachTel polling found that across the state 59.2 per cent supported the proposal and 24.3 per cent were opposed, with 16.5 per cent undecided. Aug 24, 2014 - The Mercury - HOBART City Council has accused the Mt Wellington Management Trust of failing to be upfront about a proposed boundary extension that could allow for a cable car. General manager Nick Heath has recommended aldermen make a submission opposing a zone extension, saying the Trust had not revealed the “intent, purpose and rationale” of the proposal. Aug 2, 2014 - The Mercury - TASMANIANS will get their first real say on a cable car proposal for Hobart’s Mt Wellington with the public being invited to comment on possible rule changes for development at the Pinnacle. The Wellington Park Management Trust is asking for public comment on a proposal to extend the development zone on the mountain by 11,1000sq m.
Jul 9, 2014 - The Mercury - A CABLE car on Mt Wellington is a step closer as the public is called to comment on extending the summit’s development zone. The Wellington Park Management Trust has agreed to evaluate the proposal to enlarge the Pinnacle Specific Area, which allows development. Jul 9, 2014 - The Mercury - HOBART Lord Mayor Damon Thomas has requested an internal council investigation into the leaking of documents related to the controversial Mt Wellington cable car proposal. May 14, 2014 - The Mercury - THE stand-off between Hobart City Council and cable car proponent Adrian Bold may soon end, with the council agreeing to hold a special meeting about the plan. Mr Bold on Monday ­received unsolicited support in principle from Glenorchy City Council for a cable car base station in the Glenorchy area. May 28, 2014 - The Mercury - GLENORCHY Mayor Stuart Slade wasted no time yesterday renewing his council's bid to wrangle the cable car development from Hobart after Glenorchy Council voted on May 12 to give the project in-principle support. In stark contrast, Hobart City Council refused to back moves to grant landowner consent for the project. Apr 17, 2014 - The Mercury - TOURISM and business leaders are ­calling on the State Government to take control of the Mount Wellington cable car project. Yesterday calls were growing for the proposal to be deemed a project of state or regional significance to help facilitate ­development on the mountain. Apr 17, 2014 - The Mercury - SIGHTSEERS shared a common view atop Mount Wellington yesterday. Tourists were in awe of the Hobart’s stunning landscape and overwhelmingly in favour of a cable car to complete the experience. Apr 16, 2014 - The Mercury - Tourism Industry Council Tasmania chairman Simon Currant told the meeting at Wrest Point this morning he had no doubt the Mt Wellington cable car project from Cascade Brewery to the summit would be a massive success. Mar 31, 2014 - The Mercury - BUILDING a cable car on Mt Wellington will send a clear message to investors that Tasmania is open for business, says the Housing Industry Association. The HIA is one of several high-profile organisations that have thrown their support behind the controversial proposal. Feb 1, 2014 - The Mercury - PROPONENTS of a Mt Wellington cable car are considering a route across the face of the Organ Pipes. Mt Wellington Cableway Company executive director Adrian Bold said taking the cable car as close as possible to the iconic rock structure could be the best option. Jan 20, 2014 - The Mercury - HE'S had his share of knockers, but cable car proponent Adrian Bold earns top marks for persistence. The revelation that he has gained the support of an international investor for his ambitious Mt Wellington project should be welcomed by Tasmanians ... with a tinge of caution. Jan 04, 2014 - The Mercury - MT Wellington is open for business, with a new management plan allowing for a wide range of commercial development, including a controversial cable car. The Wellington Park Management Plan, which took effect this week, opens the gates to commercial development at the pinnacle and The Springs. Oct 19, 2013 - ABC NEWS - Developers hoping to put a cable car up Mount Wellington have applauded moves in Parliament making it easier to get new developments on the mountain up and running. STAY UP TO DATE: Feel free to follow us on Facebook, Twitter or signup to our Newsletter.